The trade deficit rose to $50.1bn in July, from a revised $45.7bn in June. Total exports fell 1.0%, as the total drop in exports ($2.1bn) was comprised primarily of declines in civilian aircraft ($1.6bn) and soybeans ($0.7bn). The decline in soybeans exports likely reflects payback following a sharp increase in June ahead of Chinese retaliatory tariffs. Total imports (+0.9%) rose, reflecting increases in both petroleum imports (+3.7%) as well as nonpetroleum imports (+0.6%). The deterioration was in line with expectations, so no major impact on GDP predictions for 2018Q3 GDP. Figure 1 shows the nominal deficit, and normalized by GDP. 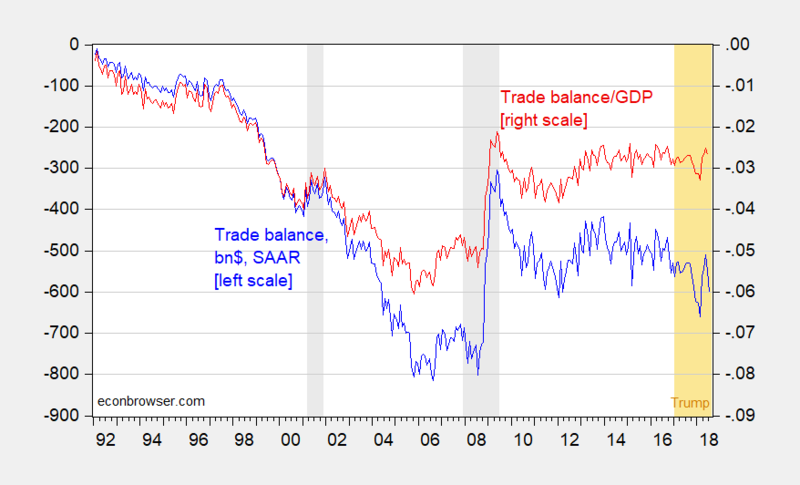 Figure 1: Nominal trade balance in billions $ SAAR (blue), as ratio to nominal GDP, cubic interpolation of quarterly data (red). NBER defined recession dates shaded gray. Source: BuCensus/BEA, BEA, NBER, and author’s calculations. So there is little progress in shrinking the trade deficit in a meaningful way, despite the imposition of tariffs. But of course, we already knew that was going to be the case. If you were hoping for a price increase in soybeans to boost nominal export values, well, they haven’t shown up yet. This entry was posted on September 5, 2018 by Menzie Chinn. Menzie takes a well deserved victory lap on the soybean issue! In my early Econospeak musing about Trump’s forthcoming trade policy disaster, I kept worrying about Boeing. And it seems their ability to export aircraft has suffered. Yea I know – Washington is a blue state so the Trumpsters likely don’t care. 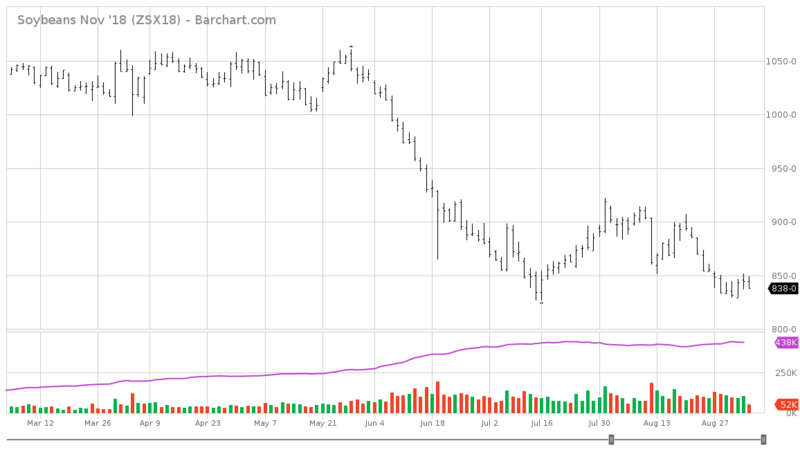 And following up further, Iowa interior soybean prices fell 6 cents to a statewide average of $7.37, which is $1.01 lower than the Nov 2018 CBOT contract. Boeing aircraft orders and deliveries are a multi-year proposal. However, “The Seattle Times” has reported that China has placed no new Boeing aircraft orders in 2018. China has accepted deliveries of previously ordered planes. OK let me explain the context. Peaky and some of his minny mes are trying to put forth that we have a large output gap because capacity utilization – manufacturing in the US is less than where it was 40 years ago or less than how it is measured in other nations. Of course international comparisons of such series are really meaningless and the natural rate of the capacity utilization rate is likely not the same as it was 40 years ago. But check out this FRED series. It seems when measured with total industry and not more narrowinly, cap util has increased over the past couple of years. I wonder if Larry Kudlow figures this out. If he does, poor Peaky will be fired for utter incompetence. After all – the economic consulting team for Team Trump is spin 24/7! If the US economy grows more quickly than other economies ( not ours I hasten to point out) then it is axiomatic your trade deficit will increase! Well said! Australia has done well in terms of growth and Down Under you guys are not freaked out about the resulting higher imports. Of course you get to export a lot of stuff to China. In the US we are killing the demand for our exports with some really dumb policy moves. No, if the US grows more rapidly than its trading partners the deficit might increase, but it is not necessarily so. Remember, imports are so much larger than exports that even if exports grow faster they may not increase more than import. Since 2013, trend real export growth has been 1.8% while trend real import growth was 3.5%. So for real exports to grow more in dollar terms, it has to overcome the longer term trend of real imports growing nearly twice as fast as real exports. 1. One result of the Trump Trade War that is likely permanent is that the U.S. will have lost the market for agricultural product with China as other regions build up and they cultivate that market in Russia, Australia, Canada, & South America. 2. Starting this autumn, I expect the Fiscal stimulus of the Trump-Ryan-McConnell tax cut for the rich will start wearing off, and the contractionary effects of the tariffs (higher prices for consumer goods) will start biting. CPI Inflation has been higher then median income growth for non-supervisory employees over the last year which is also a dent to consumer demand, and the Fed’s interest rate climb will continue as long as the CPI and PCE remain above the 2% per annum goal and unemployment remains low. At some point a fall in demand will kick in over the next 18 months and then moment where the speculative tide starts go out, that Minsky moment, and we will see in which market the swimmers who have been swimming naked. I don’t think it will be housing, where the market is already somewhat stalled and inventories increasing. I wonder about the bond market this time? Latin America is becoming an economic basket case and that will spell trouble for the U.S.
Those are shithole countries. Nothing to worry about.